This article is about the string-instrument family. For other uses, see Stradivarius (disambiguation). 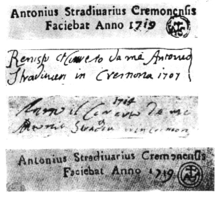 In a test in 2009, the British violinist Matthew Trusler played his 1711 Stradivarius, said to be worth two million U.S. dollars, and four modern violins made by the Swiss violin-maker Michael Rhonheimer [de]. 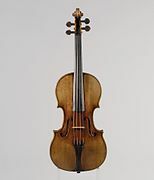 One of Rhonheimer's violins, made with wood that the Empa (Swiss Federal Laboratories for Materials Science and Technology) researcher Francis Schwarze had treated with fungi, received 90 of the 180 votes for the best tone, while the Stradivarius came second with 39 votes. The majority (113) of the listeners misidentified the winning violin as the Stradivarius. 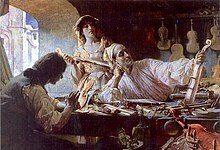 Wikimedia Commons has media related to Stradivarius.